With the birth of consumer VR, 360 degree photography and videography has gained a new lease of life. Yet it’s only recently that good quality 360 degree cameras have become affordable to all. The latest of those is the 2017 edition of the Samsung Gear 360. Let’s take a closer look, and at the end of this review, we’re giving away our test model to one lucky reader! It’s important to distinguish between the original Gear 360, and the new 2017 model Gear 360, which we’re reviewing here. Apart from specification differences, the new 2017 model has grown a handle, compared to the simple spherical shape of last year’s. 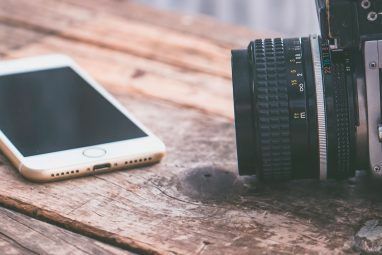 This makes it a lot easier to hold and use on its own – though mounting to a tripod is still recommended for the best quality shots, so the handle may ultimately be of limited use. In fact, it’s not even much of an improvement at all if you consider the previous device included a small tripod in the box, which could be folded to act exactly as a handle. The included tripod is replaced by a curious little rubber ring for the device to sit on. The Gear 360 doesn’t deviate much in technical design from either its previous model or other consumer 360 cameras. It compromises of two camera sensors, each with an extremely wide angle fisheye lens to capture 180 degrees each, the raw output of which looks like two circular photos. The camera then stitches the photographs together, though further processing is needed to change the circular images into a rectilinear format, the most common for uploading to 360 viewing applications. Astute readers will note the image resolution has actually decreased from the 2016 model, which is a puzzling move indeed. However, the number of “megapixels” isn’t actually an indicator of image quality. Crucially, the new Gear 360 adds compatibility with non-Samsung mobiles, particularly iOS devices, which the former was seriously lacking. There was a sort of workaround last year though: you could use Google Street View app on iOS to directly capture images from the camera, without need of any Samsung software. Sadly, this years model has actually broken that direct connection method, so you’re now forced to use the Gear 360 app to capture and save photos. This is acceptable for everything except Google Street View, where the images that Samsung’s software saves are in fact now deemed to be too low resolution for upload. The 2017 model also bumps recorded video resolution slightly to actual 4K, and adds live video streaming capabilities. Live streaming requires a device running Android Nougat OS, and is limited to 2K resolution – a deceptive term which essentially means “marginally higher than full HD”. A standard sized tripod thread mounting point is provided underneath, though as mentioned, you’ll find a small rubber ring stand in the package, useful for quickly seating the device on a flat surface without requiring a full tripod setup. Also in the package is a soft sock-like carrying case. Charging is done over USB-C. A slightly awkward micro-SD similar to a smartphone tray provides all your storage needs – there is no built-in memory. Our model came with a 128GB micro-SD card as a pre-order bonus, which we’ll also be giving to the winner. However, those purchasing new will need to add their own card before they can do anything with the device. On the side you’ll find two buttons for power and selection, while on the front (or is it the back? ), there’s a shutter button and small LCD for status messages. HDR Landscape mode is probably where you’ll spend most of your time, but it requires the use of a tripod or other stable surface for the camera, as it takes multiple shots and combines them (what is HDR photography? HDRI Photography: An Essential Skills And Workflow Primer HDRI Photography: An Essential Skills And Workflow Primer This guide outlines concepts involved in HDR photography followed by a logical progression of steps in the production of high dynamic range images. Read More ). The actual image quality is the best I’ve seen yet from a consumer level, affordable 360 camera, with some really fantastic stitching between each sensor. You’ll find better stitching in wide landscapes than tight environments – the closer an object is to the camera, the greater the likelihood of a stitching error. If you need to stand close to your camera when taking the image then, make sure you’re not standing between the two lenses. Here’s an example of an image saved from the Samsung app to the camera roll, then uploaded to Facebook. It’s possible Facebook has done some additional optimization or processing, but this is just to demonstrate the quality you’ll get using the most user friendly workflow offered. As well as different shooting modes, the Gear 360 offers different viewing modes for those images. Of these, most relevant is the single rectilinear 360 image – which the app calls “panoramic view”, where the entire 360 image can be seen at once; round view, which you might more commonly know as “that little planet effect”; or stretched view, which looks like a normal photograph, but can be moved around, either by hand or with your phone’s motion sensors. There’s also a true-4K video mode, and the quality isn’t all that bad. As I mentioned in Elecam 360 review, the problem with using resolution as a measurement of 360 image quality is that the pixels are so stretched. While a 1080p video looks great on a monitor, that same resolution looks appalling when stretched to a sphere that encompasses you. 4K video, when stretched to 360 degrees, looks roughly equivalent to DVD quality. It isn’t fantastic, but for the first time, I feel like it’s acceptable, at least when viewed through a mobile app. Here’s a video sample of our lovely chickens (you probably need to force YouTube to display the higher resolution). Although it looks pretty good in a small YouTube frame, when viewing through a desktop VR headset, the resolution inadequacy is still obvious. Despite the Gear 360 being listed by Google themselves as “workflow ready” for use directly with the Street View app, the newest Gear 360 model is in fact, not currently compatible. 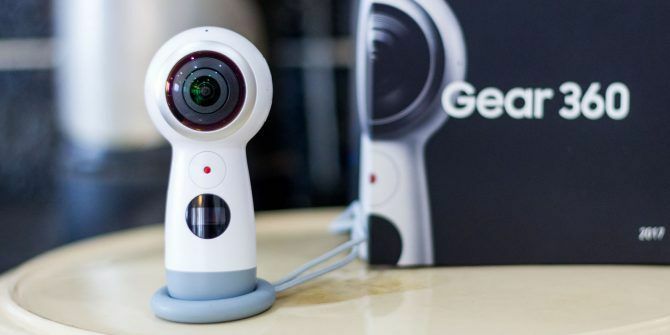 You cannot connect the Gear 360 directly to the Street View app at the time of writing, and the connection instructions found on Samsung support refer to the previous 2016 model, which is also confusingly called the Gear 360. In theory, they could fix this with a firmware update: all it needs is a particular Wi-Fi name to be broadcast, and the correct protocol implemented. At the time of writing however, there is no firmware update. You might have thought that since Samsung now provides their own native iOS app, you could simply save the photo to your camera roll, then upload that to Street View. Unfortunately, you lose some of the (already lower than last year’s Gear 360) image resolution in the process, and Street View refuses to import the photo. You can use the mobile app to process and stitch the images together, then upload them straight to Facebook — but you’re limited to about 80% of the actual resolution. For the full size images, you’ll need to pull the SD card out and access it from a PC, then use the 600mb Gear 360 Action Director software to process everything (Windows-only, a rebrand of Cyberlink software of the same name). Unfortunately, Samsung Global didn’t get the memo, and upon trying to run “Gear 360 Action Director”, found on Samsung’s own support site, you’ll be asked for a non-existent serial number. That’s the wrong Action Director, see? It’s as if giving two different products the exact same name, with identically named software, was perhaps a bad idea. You’ll want this Action Director instead, which can be activated by connecting the camera over USB. I found that link on Reddit, so thanks, internet. Unfortunately, you still can’t upload that image onto Street View, because there’s currently no web upload functionality. I should also note that codec errors meant I was unable to import the raw .mp4 video files into Final Cut, where I was hoping to edit with the VR Toolbox plugin. Action director seemed to be the only option there, and for anyone used to using professional video editing software, it’s an incredibly frustrating bit of software that requires 10 minutes just to import a 3 minute video from the SD card, then another 10 minutes to export it (or “Produce”, as their menu system calls it, because conventional naming of menu items for the sake of a familiar UI is so boring). Win the Gear 360 (2017)! Before we get to our verdict, you should probably know: we’re giving our test model, complete with 128GB micro-SD card to get you started! Enter below for your chance to win. Should You Buy a Gear 360 (2017)? If you’re looking to do Street View imagery, forget about this device. They’ve thoroughly broken the workflow and lowered the resolution. Somebody ought to tell Samsung that new versions are generally supposed to be an upgrade. Use this opportunity to snap up a bargain for one of the older models on eBay, instead. You’ll be limited to using just the Street View app on a non-Samsung phone, but you can still record and save directly to the SD card then process videos on a desktop. Also, remember that you can take a really great quality Street View image using just your phone – but you’ll be standing on the spot spinning around for a good 5 minutes, looking like a bit of an idiot. On the other hand, if you’re looking to do 360 4k videos or 360 live streaming (with a compatible mobile device), or really, really need to use the camera with an iOS device, the updated version is for you. There’s probably very few people in that camp, though. For most people, the new version seems like a step forward in ease of use for most tasks, but a step back in image quality and ease of use in other areas. Throw in naming confusion and Street View incompatibilities, and you’ve got a recipe for consumer frustration. Explore more about: Google Street View, MakeUseOf Giveaway, Photography, Virtual Reality. I love this product. Please include me in your giveaway, what a unique idea! we are so used to having every little thing Included in our phone that to have an attachment with an actual handle feels like a new idea! Great review people. Sign me up for the giveaway, please!